Of the estimated 2,000 dams in the State of Maine, over 90 percent are located in tributary streams where critical spawning habitat for migratory fish is found. Many of these dams no longer serve their original purpose, have no fishways and are often a liability for their owner. An Alaskan Steeppass fishway was installed below a Town of Carmel bridge on Soudabscook Stream. The best chance we have to restore Atlantic salmon in Maine is to focus on restoring the full native assemblage of migratory fish with which they evolved and depend on for food and protection. Just before the big rains in October, the Atlantic Salmon Federation (ASF) completed two fish passage projects in the Penobscot watershed and one in the East Machias watershed as part of its ongoing Maine Headwaters Project. These projects will directly benefit Atlantic salmon, alewives, blueback herring, eels, and brook trout. Together, they open up full access to 10,000 acres of ponds and lakes and reconnect over 100 miles of streams previously blocked by impassable dams. In the Penobscot watershed, a Denil fishway was completed below Pushaw Lake in the Town of Hudson. This project was begun in 2012, but high water prevented its completion until this fall. In September, an Alaskan Steeppass fishway was installed below a Town of Carmel bridge on Soudabscook Stream. This marked the culmination of 15 years of work in this watershed by ASF. On the East Machias, a failed, old wooden fishway was replaced by a modern concrete Denil fishway below Crawford and Pocomoonshine lakes. This was a joint project with the Downeast Salmon Federation (DSF), a local ASF affiliate that is working to restore salmon in all the Downeast rivers. DSF provided local community outreach and project coordination. ASF’s Maine Headwaters Project is focused on reconnecting key spawning tributaries to the large rivers and Gulf of Maine. There is both a tremendous need and opportunity to focus on these clogged tributaries. Of the estimated 2,000 dams in the State of Maine, over 90 percent are located in tributary streams where critical spawning habitat for migratory fish is found. Many of these dams no longer serve their original purpose, have no fishways and are often a liability for their owner. Many others are outlet dams on ponds and lakes that also lack any type of fish passage and are owned by lake associations with few financial resources. ASF’s approach is to work collaboratively with willing dam owners to craft a solution that fits their needs while allowing for restoration of Atlantic salmon and other migratory fish. This work often begins with community outreach and education and is followed by conceptual and final engineering designs, permitting, construction and post-project monitoring. The funds come from a combination of public and private grants as well as in-kind assistance. Over the past decade, ASF’s Maine Headwaters Project has completed 20 fish passage projects restoring access to 18,500 acres of lakes and ponds and almost 400 river miles. 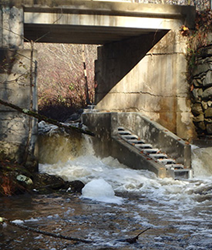 As a result, this past spring, 170,000 alewives returned to Blackman Stream in the Penobscot watershed through a fishway constructed at the Leonard’s Mills Dam in 2009. Partnerships with state and federal resource agencies have been critical to the success of ASF’s Maine Headwaters Project. Restoring alewives and blueback herring to the Penobscot and Downeast watersheds is a key goal of the state and federal fisheries agencies. Migratory fish play an important role in the river’s ecology as they travel to and from the sea, bringing in nutrients and in many cases taking out excess phosphorous from Maine’s lakes and ponds. Engineers with the United States Fish and Wildlife Service have been instrumental in developing conceptual designs for fishways. “The United States Fish and Wildlife Service has been a partner in ASF’s work for the past 15 years and we were excited to provide technical assistance and funding to help make these projects possible,” said Laury Zacari with the Service's Maine Field Office. The National Oceanic and Atmospheric Administration (NOAA) Community Habitat Restoration Center has also provided funding for fish passage projects and technical assistance. The National Fish and Wildlife Foundation, as well as groups such as The Nature Conservancy in Maine and the Maine Natural Resource Conservation Program, also provided significant funding to these projects.